We’ve been discussing lately this interesting thing from PGM XIII, the Eighth and Tenth Hidden Books of Moses, known as the Rulers of the Pole, a system of determining which planet rules over the celestial pole on any given day of the week, which is different from how we would consider planets to rule the days of the week. At first, it didn’t seem like it was used much, but after seeing parallels in what we’re talking about throughout the rest of the PGM, we realized that we’re not just talking about the celestial pole, but the northern constellations of Ursa Minor and Ursa Maior, and specifically Polaris the North Star. More than that, we also found out that there is an entirely separate but absolutely equivalent group of seven Pole Lords from the Mithras Liturgy of PGM IV. With a little bit of innovation and star-mapping, we were able to link the seven Pole Lords and their paired Fates of Heaven to the seven stars of Ursa Minor and Ursa Maior, respectively, and each pair of such stars to each of the seven planets. We’re really getting somewhere now, guys! So, now we know how to attribute the seven bull-faced Pole Lords of Heaven to the stars of Ursa Minor and the seven snake-faced Fates of Heaven to the stars of Ursa Maior, and we know how to associate each to one of the seven planets. This is all well and good, but what does it mean to approach them in this way? Well, recall from the first post I made about this topic that we’ve got two systems of understanding an “order” to the planets: the weekday arrangement (Sun, Moon, Mars…Saturn) and the heavenly arrangement or the “Seven-Zoned” (Moon, Mercury, Venus…Saturn). One of the things that I thought of was how PGM XIII might be treating each arrangement differently for different purposes, the weekday arrangement for a microcosmic or worldly purpose and the heavenly arrangement for macrocosmic or theurgic purposes. This struck me as similar to the Earlier Heaven and Later Heaven sequences of the Ba Gua, where one sequence refers to a primordial state of archetypes, the other a manifested state of change and volatility. The instruction: speaking to the rising sun, stretching out your right to the left and your left hand likewise to the left, say Α. To the north, putting forward only your right fist, say Ε. Then to the west, extending both hands in front [of you], say Η. To the south, [holding] both [hands] on your stomach, say Ι. To the earth, bending over, touching the ends of your toes, say Ο. Looking into the air, having your hand on your heart, say Υ. Looking into the sky, having both hands on your head, say Ω. Consider what we’re doing here: we’re first facing the four directions in a square, then going from down to up. We can think of this as standing in the middle of the “ladle” of Ursa Minor as Little Dipper to face the four stars at the corners of the most distant part of Ursa Minor, finishing with the Sun; the three stars on the “handle” of the Little Dipper reflect the vertical ascension represented by Mars and culminating with Saturn, appropriately looking directly up into the sky. The use of the counterclockwise motion (facing east, north, south, and west for the first four planets) is odd, as usually we’d be accustomed to doing things clockwise; this would also be expected if we look at the stars of Ursa Minor, where going from Kochab to Pherkad etc. is also done in a clockwise way. But, that’s from our point of view “down here”; if we were to consider the perspective of Aiōn who is above the stars, then looking down from that super-celestial perspective, it’d be from a counterclockwise perspective. Plus, there’s also the notion that while the stars appear to revolve around the Earth in a clockwise motion, the planets themselves pass through the skies in a counterclockwise motion (which is why the Zodiac is always drawn in that way). What we’re doing, then, is starting out with the assumption that we’re already celestial, and acting in this world accordingly; it’s the same logic as to why we’d use the macrocosmic Seven-Zoned heavenly-arrangement order of the planets to determine the Pole Lord of the day instead of the microcosmic weekday-arrangement order of the planets. Perhaps, this was the intent of countermovement in the ritual practices of the PGM. Not necessarily a specific manifestation of a single countermovement cycle, the universe is resplendent with such examples; but rather orienting the practitioner towards the equilibrium and unity of the celestial pole as a source of stability and power by which to approach the deeper mysteries of our cosmos. Admittedly, this is a bit of a stretch; it’s one thing to understand this tiny Heptagram rite, this dinky Calling of the Sevenths that so many who are familiar with PGM-style magic are aware of, as a planetary attunement ritual to balance and fix planetary powers within ourselves. It’s something else entirely to say that it’s an act of theurgic elevation unto itself by imitating the arrangement of the stars of Ursa Minor. That said, it’s the performance of the Calling of the Sevenths immediately before an invocation of Aiōn, where we call on Aiōn as the gods, as the goddesses, as the winds, as the four directions and as the Earth, Sky, and Cosmos itself that makes me think that we’re essentially “stepping” our way through the seven heavens, gaining the power of the seven Pole Lords all at once so that we can finally approach and address Aiōn as the true Ruler of the Pole above the Pole Lords themselves. I call on your name, the greatest among gods! If I say it complete, the earth will quake, the sun will stop, the moon will be afraid, the rocks and the mountains and the sea and the rivers and every liquid will be petrified, the whole cosmos will be thrown into confusion! I call on you, ΙΥΕΥΟ ΩΑΕΗ ΙΑΩ ΑΕΗ ΑΙ ΕΗ ΑΗ ΙΟΥΩ ΕΥΗ ΙΕΟΥ ΑΗΩ ΗΙ ΩΗΙ ΙΑΗ ΙΩΟΥΗ ΑΥΗ ΥΗΑ ΙΩ ΙΩΑΙ ΙΩΑΙ ΩΗ ΕΕ ΟΥ ΙΩ ΙΑΩ, the Great Name! There’s no explanation, whether in the text itself or in footnotes by Betz, as to the origin of these names or images, and I’m associating them to the planets because it does seem appropriate to the context. How might we reconcile these names and images? Though I’ve already made an attempt to explain this before, now that I’m thinking about stars, there are four constellations that would match these images verbatim: Lynx, Aquila, Serpens, and Phoenix. Of these four, Serpens and Aquila kinda match with their corresponding directions, though Lynx is way too far in the south, and Phoenix is way too far in the southern hemisphere to likely have been used as a constellation; Phoenix, after all, doesn’t show up in Ptolemy’s list of constellations, and its first official documentation in the West comes from the early 1600s. There could be an association with a specific fixed star, but I’m unsure. However, traditional accounts of the Phoenix also describe it as eagle-like, but neither eagles nor phoenixes played a role in Egyptian mythology. If we broaden the semantic notion of “eagle” to mean raptor or predatory birds, then we’d also include hawks and falcons, which would lead us sensibly to the solar gods Horus and Ra. Horus could reasonably be considered more northern in concept, as one of Horus’ forms is Harpocrates, which I associate with the north according to a variety of PGM selections and which is also generally considered to be the Sun’s renewing strength at the winter solstice. Ra, being Ra, could be considered the more purely solar, and thus southern, of the pair, and has associations with the Bennu, a type of supernatural heron which was likely the inspiration for the original Phoenix myth in Hellenic cultures, and which was connected to Ra. So…maybe this is less of a solar thing and more of a mythological one. If we keep going down that road, then there’s also a mythological connection between the Lynx and the Snake in Egyptian belief: Mafdet, the goddess of the execution of judgment and protector against snakes, was sometimes depicted as a lynx, and the lynx fought existential evil embodied by Apophis, the eternal serpent. Then we have the issue of the images of Life, Power, and Necessity, which seem more Neoplatonic or even gnostic and less Egyptian in essence to me. I’m not going to explain those here, but I leave it for consideration how Life could be naturally associated with the Earth and those that live upon it, Power with the power of the gods who live in the sky—which is the association given to the “direction” of Jupiter—and Necessity (i.e. Anankē or Adrasteia) with the primordial, hypercosmic forces that determine the fate and role of all that exists below which is fitting for Saturn, the cosmos, and the notions of Pole Lords and the Ruler of the Pole from above. A simplistic association, but at least it makes sense in a straightforward manner. Roger Beck (“Interpreting the Ponza Zodiac: II”, Journal of Mithraic Studies, vol. 2, no. 2) says that the Fates of Heaven and the Pole Lords of Heaven are associated with not only moving and controlling the actions and motions of the cosmos, but are also associated with Fate, punishment, and reward. Moreover, given their role as the stars of the Bear constellations, they are not just symbols of such power and control, but they are agents of it. Because they have exactly parallel structures, they may also be considered to be seven pairs of deities, one snake-faced virgin and one bull-faced youth, each pair related to one of the seven planets. As indicated from all those Bear charms from before, and based on some of the invocations of PGM XIII, the Pole Lords are not the highest power in the cosmos; they may rule the Pole, and their rulership of the Pole amongst themselves changes from day to day, but they rule the Pole in the name of and under the supervision of a true Ruler of the Pole, which is Aiōn, and in a more properly Mithraic context, Mithras himself, the god of revelation in the Mithras Liturgy. There’s a subtle distinction being implied in PGM XIII that there are planetary rulers and then there are planetary Lords: the ruler of the day “in the Greek reckoning” is not the true Lord, which follows a different method of reckoning. 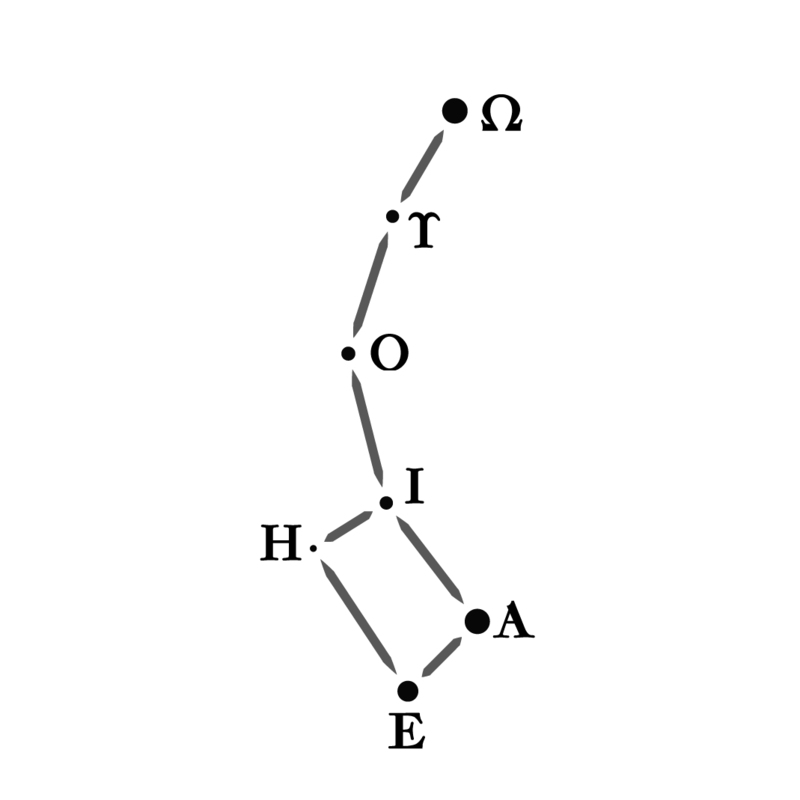 This recalls the notion of the Greek versus Phoenician method of navigating according to the northern stars: the Greeks originally used Ursa Maior as a general indicator of north, but this gave them varying and vague and wandering results. The Phoenicians, however, used Ursa Minor and Polaris, which doesn’t wander or vary as much, and so obtained a truer and more steady path north. What we’re arriving at is an understanding that one can approach the planets “down here” in a microcosmic way or “up there” in a macrocosmic way that is more true and real than the microcosmic. By approaching the macrocosmic (or even hypercosmic) planetary Pole Lords “up there” through imitating their motions and calls upon the true highest, hypercosmiciest Divinity, we can break past the “images” and into a truly higher state of being in communion with the highest divinity, Aiōn, who has power over all fate and happenings. This is done not through the usual planetary motions, but through the planetary harmonies and rulership of the celestial pole and the stars found there, Ursa Minor. By identifying with the Sun, we start off as “a star wandering about with you and shining forth out of the deep” (PGM IV.574ff), but eventually we come to identify with Aiōn itself in a process not unlike that of the magician in the Headless Rite, where one begins addressing Akephalos but eventually becomes Akephalos. By becoming the only one who can say the full name of Aiōn, a name “not even the gods can utter”, one takes on the full power of Aiōn, which can only be done through working through, assimilating, and being accepted by the various Pole Lords to become the true Ruler of the Pole. Not too shabby a result, I suppose. The names and images of God from PGM XIII can be used as microcosmic presences of seven planets; thus, an “esoteric” name for the Moon can be KHEKHAMPSIMM, which may be used in PGM rituals to refer to the Moon instead of just saying “the Moon” or Selēnē. The Fates of Heaven from PGM IV are the macrocosmic presences of the seven planets, subservient to the Pole Lords but which are higher than the names and images of the microcosmic planets. It is these stellar entities that determine what is permissible in the world we live in, and wield authority (their “golden wands”) over the world. They determine order and structure of things. The Pole Lords of Heaven from PGM IV are the hypercosmic presences of the seven planets, subservient only to Aiōn. These entities permit powers and ideas to pass in and out of the world under them which they rule (their “golden diadems”) but whose orders the Fates execute in their name. In other words, it is through the seven Pole Lords that blessings, curses, creations, and destructions are ordered in the world we live in. Once they give the order, the corresponding Fate executes the will of her Pole Lord through the work of the seven images of God, not just the one specifically granted to the same ruling planet of that Fate and Pole Lord. Even then, amongst all the planets, it is still the Moon that is most important; knowing that its image is the Lynx, associated with the divinity Madfet, it is the Moon that truly opens up the light and presence of all the Pole Lords and Fates of Heaven, because it is the Moon that is closest to the heart and presence of the constellations of the Pole. We must always start with the Moon, and through the Moon honor the entirety of the Pole Stars; through the passage of and through the Moon, we can ascend through the other planetary heavens and achieve the blessing and acceptance of the other Fates and Pole Lords of Heaven until we reach the final pair, the last stars of Alkaid and Polaris. Once we reach them, we have finished our approach to the Pole and then may surmount it, leaving behind this world under their power and entering into the presence and power of Aiōn. I’m tempted to draw a parallel between the later notions of planets having spirits and intelligences, or to how all the different spirits of the planets in the Picatrix may be thought to have particular roles in the governance and execution of the powers and presence of a planet. However, that’s not quite the same feeling I get from the Pole Lords and Fates of Heaven. I’m content with considering the names and images of God from PGM XIII to be esoteric associations of the planets, and I look forward to applying them in rituals that call on them (e.g. “o blessed light of Selēnē shining forth from the East, you who are KHEKHAMPSIMM…”), but it’s calling upon the Pole Lords and Fates that I want to figure out. Honoring the Pole Lord of the day makes sense, sure, but it also makes sense to honor the Pole Lord with its corresponding Fate, almost as a supercelestial King and Queen, or divinity with its consort. It makes for a beautiful theurgic mystery, at any rate, and I’d like to take that into meditation and consideration in future works. I suppose it can make sense to call on the Pole Lord and Fate as PGM-style “planetary intelligences” to guide and direct the powers of the planets “down here”, much as we’d call on Michael and Nakhiel to guide the activities of Sorath, but something about that nags at me. Still, it’s probably not a bad idea to do just that, especially if what we’re trying to do is plug into a true source of Divinity and bring down immortal power from the immortal heavens. If nothing else, we’ve figured out a little more about the Pole Lords and the Seven-Zoned of PGM XIII, and now I’m content. Time to share my findings back on that Facebook post in the PGM group and see if it can’t start more conversation.